Or more correctly, 2 half heel flaps. There is more to the heel than the flap, there is the turning and the gussets, too. I don't know if I will have enough of the grey yarn to turn the heel. But I will manage. I can, once the flap is finished, pick up the first gusset (on the right side of flap—normally the second gussets picked up) work the turning in the striping yarn, and then pick up the second gussets (on the left flap—normally the first gusset picked up) and continue! If worst comes to worst, and I run out of the grey, I can just make a slightly shorter flap--though I really hope I don't have to! Right now, I have about 1.25 inches of flap knit—and everything looks funny—since I tucked the skeins of yarn into the leg of the sock (so as not to get them tangled with the bobbins of grey yarn) and made them puffy! The stitch pattern in the flap is a sort of half birds eye stitch. I am slipping stitches on right side of work only, and 1 row is an AbAb pattern. The wrong side row is a standard S1, purl all. The next right side row is a bAbA pattern. 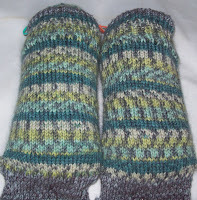 So the slip stitches are not lining up in columns as is the more usual style. The semi solid grey looks great I think with the stripes and stitch pattern. It looks almost patterned too! It is a bonus that it is such a great color match—and totally unintentionally so. I was attempting a dusty blue! Which is a neat segue into this.. This is a 400 some odd yards of Trekking natural—bought 2.5 years ago in Imagiknits in SF—it has been waiting to become something –and the first step was taking on color. These are not exactly the colors I hoped for.. but then, I dye very carelessly.. I almost never measure, and never pretest, (on a piece of paper toweling or something.) I mix up food coloring in disposable cups (usually washed yogurt cups) with a bit of vinegar, pour and go! The results are always a bit of surprise—and I like that! I was hoping for a more midnight blue/purple, and while the it looks pretty purple in the image, in reality (or rather in natural light at home!) the purple is more of a reddish plum purple. (or maybe concord grape purple) than dark blue violet. But—there are patches of blue violet.. so I have blue (a very little) blue violet (a bit more) plum /grape, (a lot,) green (a little) and blue green (a fair amount!) --and I am not disappointed with the results. The yarn will still have to wait a while more to become something.. I like having yarn (new) or newly dyed, to sort of ferment—and let it slowly let me know what kind of sock it wants to be. It will almost certainly become socks (sometime this summer—weeks from now!) --but what style, and what stitch pattern—well-- that's still not known! I didn't do anything on the Clown Barf Scarf—or take any photos of my lack of progress! That Trekking is so pretty! How do you get your colors to be so vibrant? I love how you dyed that yarn!